When it comes to the onset of fall, there are two types of people: Those who can’t wait to ditch their swimsuits and sandals for all things cozy and pumpkin spice, and those who cling desperately to the last days of summer and try their absolute hardest to wear sundresses and shorts, even long after it’s considered socially acceptable to do so. However, even if you, like me, fall into the latter camp (no pun intended), you have to admit that there is something at least a little bit exciting about the new styles that come with a change in season. And, as far as fall is concerned, one of the easiest and most fun ways to try new trends is through footwear–particularly boots. Three of the trendiest boot styles that I have noticed lately include cowboy boots, hiking boots, and snake-print boots. 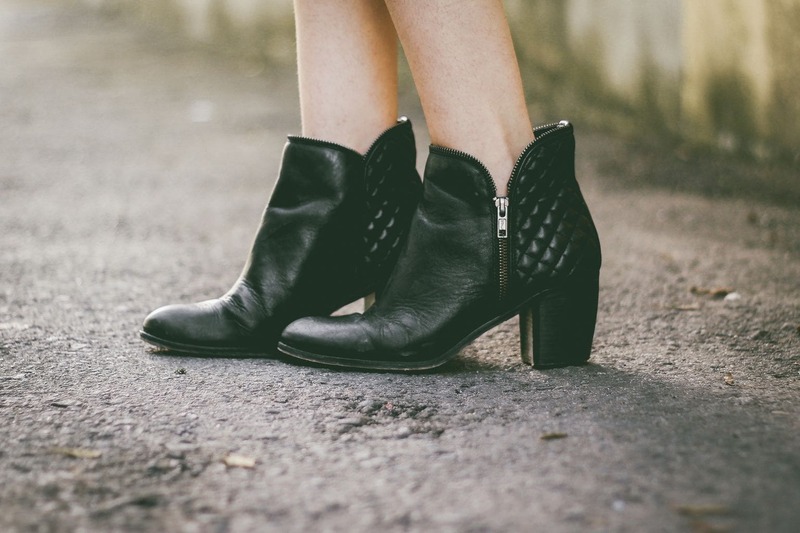 Want to know how to incorporate these boot styles into your fall wardrobe? Just keep scrolling! When you think of cowboy boots, chances are that you think of a Western-inspired outfit that features jeans and some sort of blouse or button-up shirt. However, here, I decided to put a bit of an edgier, more urban spin on things by styling a pair of amazing, modern-looking cowboy boots with sleek and modern pieces. To get the look, begin by putting on a gray oversized sweater. Next, add a faux-leather skirt with cool zipper details. If it’s cold out, put on a pair of opaque black tights, but if it’s still warm enough, feel free to go without. A utilitarian khaki shirt-jacket makes for a great lightweight layering piece, while a maroon tote adds a subtle dash of color. Small hoop earrings, a double-layer coin necklace (a summer trend that will still look totally awesome come fall), and a gold wrap bracelet complete the ensemble. If your style is feminine and/or boho, then you need a versatile pair of hiking boots in your closet! This trendy style, which was once reserved for outdoor activities, is perfect for wearing with flowy ensembles, as they really do help to ground these types of looks and tie everything together. I really love this chic black pair as they don’t look too outdoorsy, but still retain some of that rugged feel. A beautiful floral dress (love the sweet tie-neck detail!) is the perfect contrasting piece to pair with the boots, and really gives off a stylish boy-meets-girl vibe. A heavier-looking sweater in a neutral color lends an air of timelessness, and chunky knit socks give a nod to the hiking aesthetic, without taking it too literally. A beret and saddle bag are always a good idea for those times when you want your look to exude classiness, while these sparkly stud earrings and rings subtly add some elegant boho-chic to the outfit. Complete the look by painting your nails in a dusty-pink shade–the perfect fall nail color, as far as I’m concerned. This look was actually inspired by this outfit that I happened upon while casually looking at a pair of luxe snake-print boots by Chloé on NET-A-PORTER (A girl can dream, right?). And, the moment I saw it, I knew I had to re-create a budget version of it–starting with these affordable Zara boots. 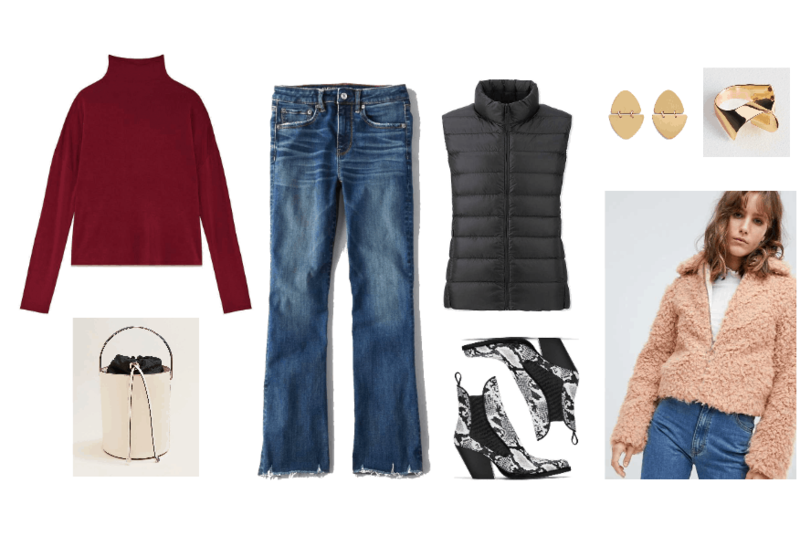 If you want to copy the rest of this cozy and easy-to-wear fall outfit, simply start by putting on a turtleneck t-shirt or sweater in the color of your choice (I really like this maroon one. ); then, add a pair of cropped flare jeans. A black puffer vest is a great basic to take you through fall and winter, as it can be styled in so many ways–I especially like how it looks layered under a stylish pale pink nubby jacket. As for accessories, this classic off-white bucket bag with a super-cool metal handle proves that wearing white after Labor Day is very much a fashion “do,” while minimal-yet-statement-making jewelry, like these matte gold drop earrings and architectural wavy ring, add some uniqueness to the ensemble. Which of these boot styles is your favorite? How would you style them? Which fall trend(s) are you looking forward to most?